Arusha Gordon remembers hearing the decades-old stories from her Native American clients about the challenges of voting back then. Polling places were often miles off reservation and located in mostly white towns whose residents were not always welcoming, said Gordon, voting rights counsel for the Lawyers Committee on Civil Rights Under Law. James Tucker heard the same stories from tribal members who said it was sometimes easier to skip elections completely. Those challenges are a thing of the past say Gordon and Tucker, the voting rights counsel for the Native American Rights Fund. But voting can still be a challenge for Native Americans, who may face language barriers, registration difficulties and a lack of access to polling places and government services that can ease the voting process. Voting was still relatively new for Arizona tribes in 1968 when President Lyndon Johnson sent his “Special Message to the Congress on the Problems of the American Indian: ‘The Forgotten American.’” The Snyder Act granting U.S. citizenship, and voting rights, to tribes was not passed until 1924 and it was not until 1948 that the Arizona Supreme Court guaranteed Native Americans in the state the right to vote. Voting records cannot be kept by race, so hard numbers on Native American participation are difficult to come by. But the hurdles to voting are not, say Gordon and Tucker, who point to language as one of the most obvious. 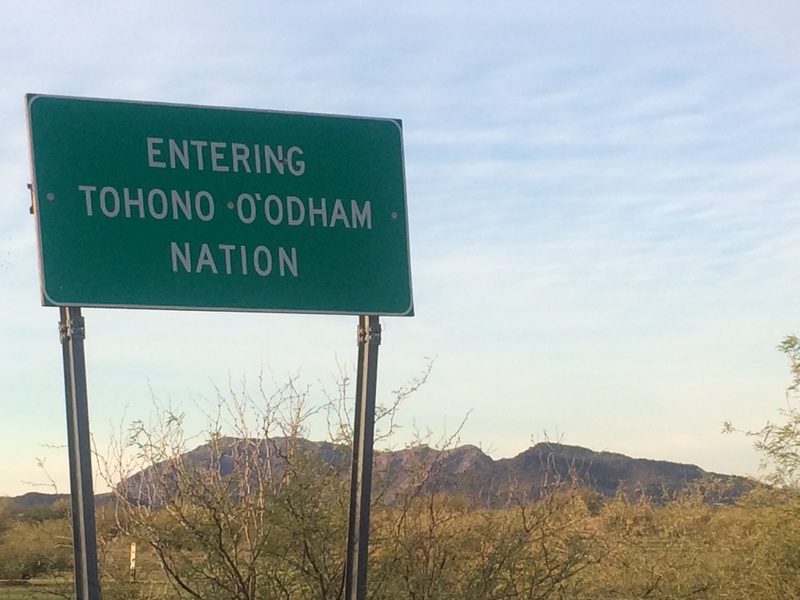 In 2000, Arizona was required under the federal Voting Rights Act to provide bilingual voter registration and voting materials in six different Native American languages: Apache, Navajo, Pueblo, Tohono O’Odham, Yaqui and Yuman. After 2015, only Apache and Navajo were still required. “The Census Bureau issues new language determinations every five years and Arizona dropped those languages based on those determinations,” Tucker said. But Gordon said the change made registration and voting nearly impossible for Native Americans who only spoke the dropped languages. Being able to read voting materials is one thing. For Native Americans, being able to fill them out can be another – it’s hard to put your address on a form if you don’t have a standard street address. That form allows would-be voters to describe their home’s surroundings, give directions or add distance measurements to the home in the address block, said Matt Roberts, a spokesman for the Arizona Secretary of State’s office. But Gordon said that can cause problems if county officials then use a single address, like the closest government service center, for all the voters who used the draw-a-map method of giving an address. “In Arizona, you can have on your license your non-traditional address … but then when (Native Americans) go to vote, the address on the poll books is listed as the service center,” she said. Under Arizona law voters must show poll workers a “sufficient photo ID” with an address that matches the poll books, like a driver’s license. They can also show two forms of non-photo ID – a utility bill, a bank statement, a tribal enrollment card, among other forms – or one non-photo ID and one photo ID, if the address on the latter does not match the poll books. It shouldn’t be that way, said McCool. “Many people living on Indian reservations do not have a street address, but they still have a right to vote,” he said. Before they even get to a polling place, however, tribal members may face problems registering. Arizona law requires proof of citizenship for a first-time registrant. That can be met by Native Americans who provide a tribal ID number, but Gordon said that number is not always available. In that case, it takes a copy of a birth certificate, passport or other specific form. But in remote areas, it can be hard to get to the office that keeps records like birth certificates – if there’s a birth certificate at all. Many government service centers, including polling stations, are located off-reservation and some Native Americans have to travel hours just to get basic services, Tucker said, let alone cast a ballot. Rep. Tom O’Halleran, D-Sedona, said there’s no reason Native American voters can’t have the same unhindered right to vote as any other citizen. “As citizens of the United States we should make sure they know who they’re voting for, what issue they’re voting for and be able to get that ballot to the voting location,” O’Halleran said. Even though the problems today may be different than 50 years ago, more progress needs to be made, he said. “No (citizen) in America should be kept out of voting because of a language barrier or because they can’t get to a voting location in time,” O’Halleran said. It’s certainly true that voting in Native American communities presents numerous administration challenges for election officials due to their size and remote nature – but it’s good to see a focus on the work that must be done to ensure that any voter who wants to cast a ballot can do so. Thanks to Cronkite News for sharing this story … and stay tuned! Be the first to comment on "Cronkite News Examines Challenges for Native American Voters"